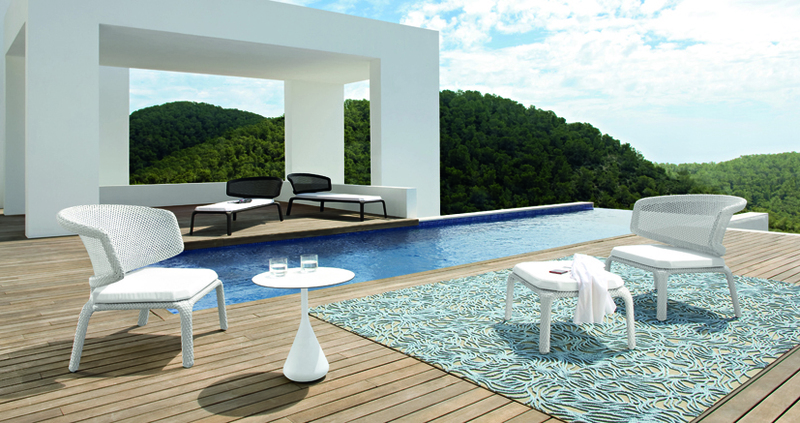 The Dedon Obelisk line of furniture is as much a work of art as it is a functional table with four chairs. 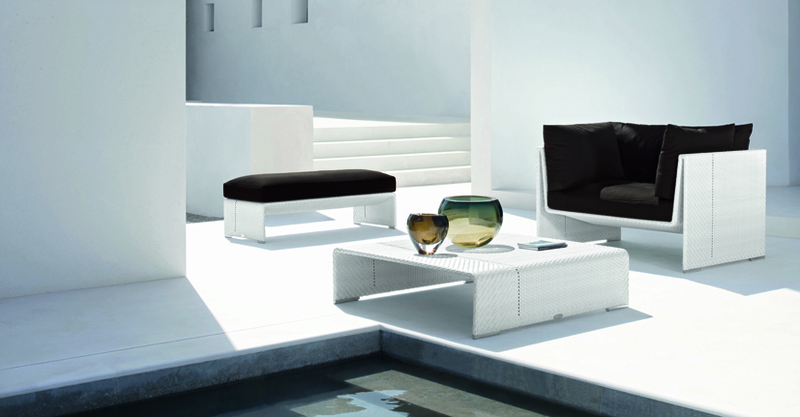 Stacked, each chair creates a decorative pylon-accent for your patio. When dismantled, the modern appeal of each stone textured chair brings a whole new meaning to the phrase, flare with functionality. 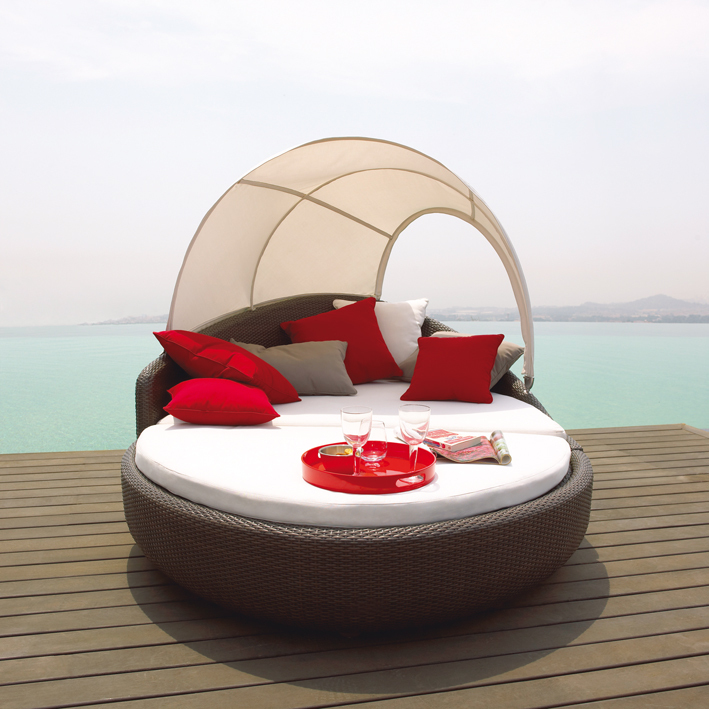 The Seashell collection by Dedon combines the sturdy, organic, and naturally symmetry of a seashell, with the light, breezy translucence of white sandy beaches and clear tropical waters. The Satellite series table adds to the elegance of this set by blending into the curvaceous décor, rather than dominating it. The Yin & Yang concept chair looks elegant, eccentric, and almost isolated when apart, yet harmoniously balanced when placed together. The almost impossible weave pattern stretched across each chair offers two very disjunct colour elements of bronze and platinum, representing the interdependence of natures most mysterious forms. The Slimline furniture set by Dedon strips away the complex theory of beauty and elegance and breaks it down to its barest essentials. 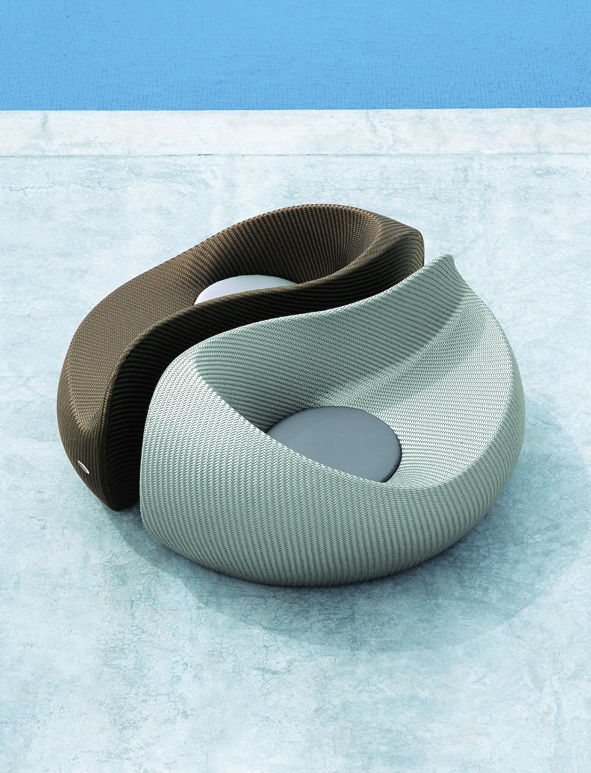 The lightweight and open design allows each piece to mold itself into the background, without taking away from its connection with the natural outdoors. There is nothing more tranquil than sailing on crystal emerald waters with a gentle breeze blowing across your sails. 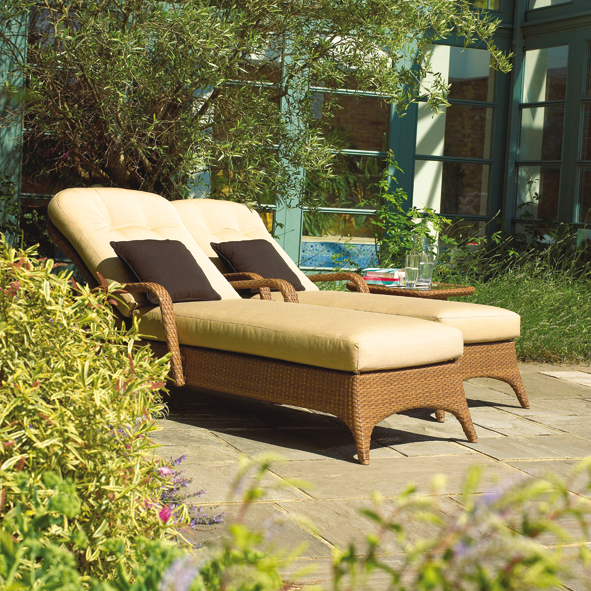 Gloster has brought the sail to the landlubber in their woven relaxer, which combines the comfort of a deep seated armchair with the soft glow of sunlight cast through the trickled leaves of a saga palm. 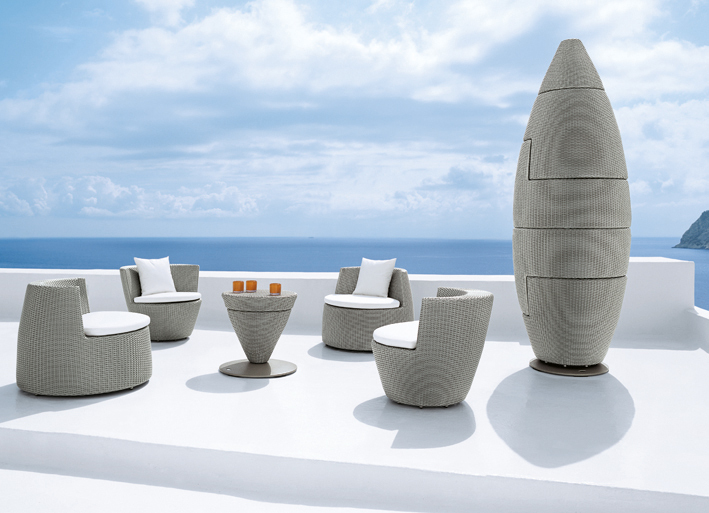 The classic beauty and outdoor strength of wicker loungers has remained a staple in the resort industry for decades. Add a thick, comfortable pad, a chair side table, and a little sunlight, and you have the base ingredients to a tropical escape in your own backyard. 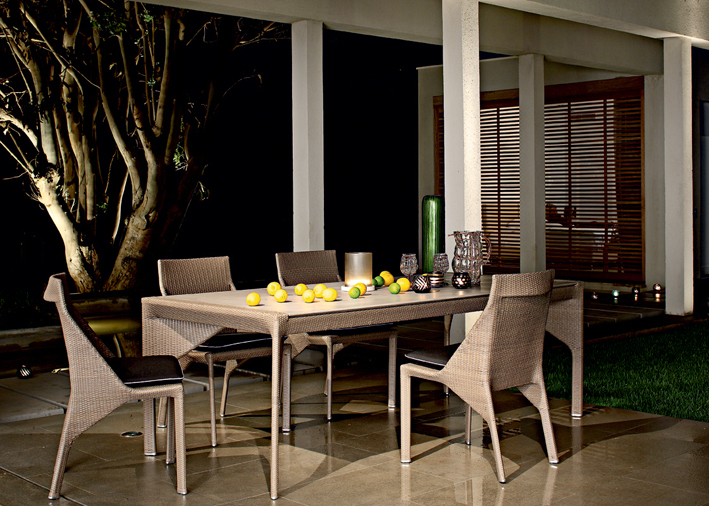 The Bel Air dining table by Roche Bobois is their first attempt at an outdoor collection, and a fine one at that. It’s slim, modern profile provides the base for a subtle, dramatic appeal, while the extended panels on the sides wrap each guest with a secure sense of beauty and purpose.